One of the most under-appreciated aspects of automotive interior trim is the care and treatment of leather hides. From the day that the leather has been prepared by the tannery it continues to lose the original oils that keep it supple, soft-to-touch, and its unique aroma. By replacing the lost oils for very minimal cost and labour input, you protect the interior trim and maintain its appearance and tactile qualities. 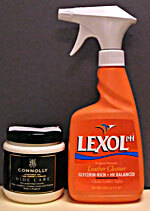 Lexol Leather Cleaner removes the in grain dirt which robs the hides of their color. This treatment is the best investment that you can make in any classic automobile, the return in enjoyment and the long lasting benefits to the leather is incomparable. For Connolly Hide Care, click here.